Question: How often do you train in the pool or open water on a weekly basis? Bob García: I swim seven sessions over six days per week, along with a mix of other types of training regimens. I’m self-employed in the online marketing industry. Therefore, I have a flexible work schedule, which helps to accommodate training hours at odd hours of the day. I live and train in San José, Costa Rica, at an estimated elevation of 3,845 feet (1,172 meters) above sea level. The closest beach for open water swimming is 2 hours away, so I normally toe-the-line for an open water race with very little preparation in the ocean. Rest, or a very light bike ride that includes several stops at local coffee shops. A perk of living in Costa Rica is its readily available premium coffee blends. 1 dryland session of old-school strength training in the gym + 1 Aerobic Recovery A1 pool session (4-5,000 meters). I strip the gym session down to the basics: no fancy machines, heart rate monitor, Tabata timer or EDM (Electronic Dance Music) playlists. I rely on my sweat and pain as evidence of an effective session. In the pool, my main objective is to flush out the rest day and loosen up sore muscles from the weight room. 1 high-intensity functional training session + 1 Aerobic Maintenance A2 pool session (4-5,000 meters) with a focus on the 4th stroke — kicking. The functional training session takes place at a local fitness center and involves a mix of 30 seconds to 1-minute intervals of circuit style training, which includes: power sled, dumbbell squats, lateral lunges, battle rope, and plank variations. I’m typically in bed by 7:30 pm the night before to prepare for this day. I begin with 1 early morning pool session (5-6,000 meters) at 5 am, which includes a mix of Anaerobic Race Pace and Aerobic Development A3 training + 1 dryland session on the Vasa Trainer Pro, plus a 10 km run. I’ll set-up the Vasa Trainer with two resistance cords linked to the bench and paddles strapped to the trainer’s front-end. I’ll do 30 x 45-second intervals with 15 seconds rest. During each rep, my core is tight, feet are pointed straight and elbows high – doing a full range of movements that simulate the catch and pull phase of the freestyle swim stroke. Immediately following the morning swim and workout on the Vasa Trainer, I’ll step out for a 10 km tempo run @ 4:45-5 min per kilometer pace. In the evening, I swim again with a Junior/elite group that repeats a pool session (5-6,000 meters) similar to the morning workout. 1 strength training session in the gym + 1 Aerobic Recovery A1 pool session (3-4,000 meters). I’m usually taxed from the previous day, so I try to fuel my body with a good mix of quantity and quality food and rest. 1 Aerobic Maintenance A2 pool session (5-6,000 meters) with the Junior/elite group + 1 dryland session on the Vasa SwimErg. My focus on the SwimErg is to build sustained power. I’ll typically do a 30-45 minute time trial with a (medium-high wattage range) that feels like a high degree of perceived difficulty level. 1 Anaerobic Race Pace and Aerobic Development A3 pool session (6-7,000 meters) with the Junior/elite group. Following each workout, I stretch 10-15 minutes, hydrate well and fuel my body with a clean diet. However, coffee, ice cream, and cake are my kryptonite. If time permits, I’ll book an appointment once a week with a deep tissue massage therapist. I live a healthy lifestyle, consistently sleep between 7-9 hours per night and avoid drinking. My last taste of alcohol was 20 years ago. Q: What do you do for dryland training? 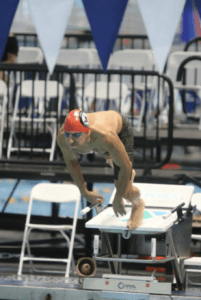 Bob García: In the weight room, my main objective is to build power that translates into faster freestyle swimming. 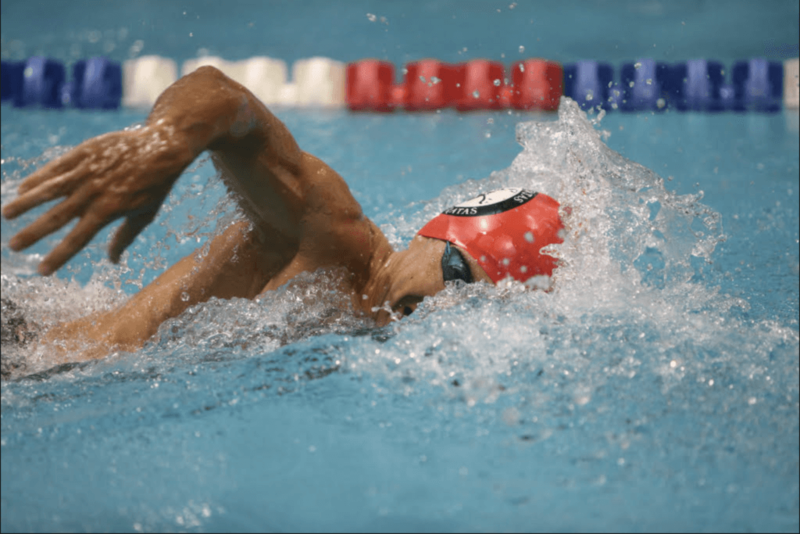 I won’t spend time on a single repetition that isn’t focused on executing the range of movements in the freestyle stroke. This involves pull-ups, medicine ball exercises, seated rowing, bench press, and my favorite weight room exercises: 1-arm dumbbell rows. In between sets, I’ll do a 1-minute active rest interval with a jump rope. I also do a mix of jogging, functional training, and workouts on the Vasa Trainer and Vasa SwimErg using an elevation mask for respiratory muscle training (RMT). Q: What open water swims have you participated in? 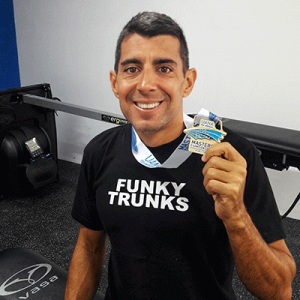 Bob García: Despite having raced Ironman distance triathlons for 5 years, I only recently started swimming in Open Water Swimming races. In 2017, a great friend from South Florida with whom I swam as a youth swimmer at Coral Springs Swim Team passed away. As a tribute to my friend, I trained outside of myself in preparation for the 2017 edition of Swim Around Lido Key in Sarasota, Florida. The event was sanctioned by U.S. Masters Swimming and billed as the 2017 National Open Water Championship. I won my age-group, enclosed the gold medal in a FedEx envelope, and mailed it to my friend’s dad as a symbol of respect and appreciation. In between the 2017 U.S. Masters Swimming open water championships and now I’ve raced a handful of local events. Most recently, I swam at the 2018 UANA Pan American Masters Swimming open water event at Daytona Beach, Florida. I won my age group and finished 9th overall among open water masters swimmers from all parts of North, Central and South America. Q: Which open water events are among your favorites? Bob García: 5 kilometers is the distance that I feel most comfortable. Anything shorter feels too explosive. Anything longer makes me feel bored and burnt out. I enjoy straight-line swims and despise triangular or rectangular courses. 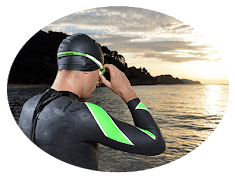 I feel course cutting occurs often in open water swimming events that require navigating around a circuit. Warm water ocean swims are my preferred choice over cold lakes and rivers. My body fat percentage varies throughout the year, but it remains within a 5-7% range. That said, I suffer a lot when swimming in cold water. Q: Do you do anything specific in pool workouts that are beneficial or advantageous in open water swimming competitions? Bob García: Once a month I train in an Endless Pool against a steady (challenging speed) current. There’s also a handful of drills I do in the pool that focuses on open water breathing techniques. For the past 3 years, I’ve been coached by Kurt Niehaus Bonilla of Costa Rica. Kurt is a former world-class open water swimmer. I’d say 80% of his training plan is open water-focused. Timed 20-minute maximum effort tests: 10 x 200’s, 5 x 400’s and 4 x 1,000’s are sets commonly seen scribbled on Kurt’s whiteboard. Q: Do you do anything specific with your Vasa Trainer that is beneficial or advantageous in open water swims? Bob García: On the Vasa, I incorporate a mix of workouts that combine high tension/fast repetition speeds with low tension/slower repetition speeds. Developing an ability to change pace at strategic points in an open water swim is key to me. I’ve found this type of training to be effective in improving my ability to comfortably change pace. Q: What are your future plans for open water swimming? 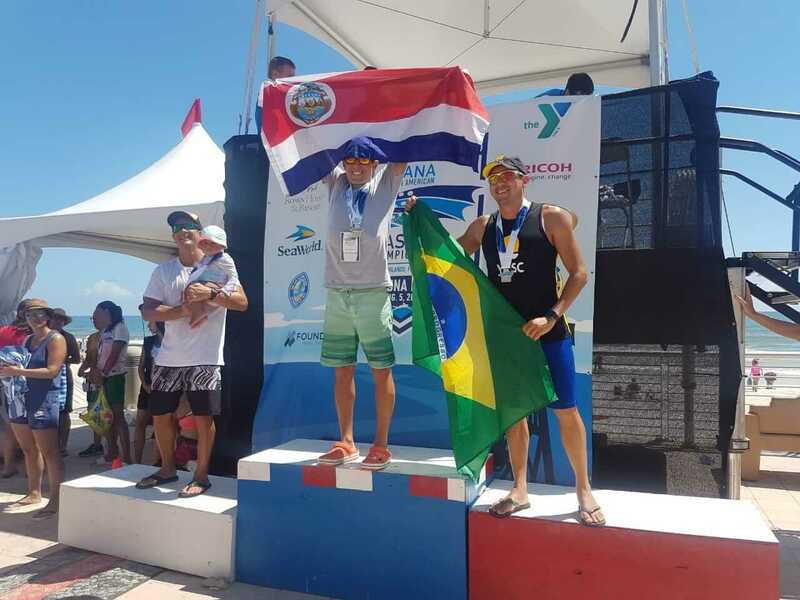 Bob García:: For the remainder of 2018, I’ll race the final two legs of the Costa Rican open water swimming circuit (Circuito Aguas Abiertas). At the time of writing, I’m ranked third overall in the open/elite category, racing against high school kids and swimmers half my age. At the age 41, competing in that category is challenging, but it keeps me motivated and feeling young. I truly prefer to swim my guts out and finish 20th against a field staked deep with high school swimmers chasing Olympic dreams, then standing atop a podium with swimmers my age. For the past three years, it’s been a tradition to end the season with a set of 100 x 100’s. A few years back, a group of friends and I went a bit overboard and swam 200 x 100’s on 2-minute intervals. Two-time Olympic swimmer Juan José Madrigal, Juan González, Andres Gutiérrez, Carlomagno Gonzálezand Dr. Max Morera accompanied me on this massive end-of-year set. There were no finisher medals or fancy certificates. It was just for fun. I plan on ending 2018 with a set of 100×100’s. In 2019, my sights are set on performing well in the pool and open water. First on my list is an ambitious goal. I aim to qualify for the 2019 CCCAN Championships which will be held in Barbados. CCCAN Championships gather the top age-group swimmers from Central America and Caribbean swimming federations. To qualify, I’ll have to finish top 2 at Costa Rica’s national open water swimming championships in the 18 & over category. Representing Costa Rica as part of the national elite squad in my 40’s would be a dream come true. 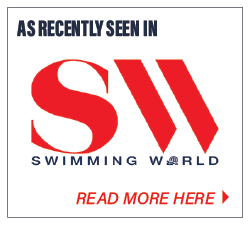 From August 7th – 11th, the Marguerite Aquatics Center in Mission Viejo, California hosts the 2019 U.S. Masters Swimming Summer National Championships where I will swim in pursuit of a medal in the 200m, 400m, and 800m freestyle. My sights are also set on winning the U.S. Masters Swimming Marathon-Distance (10 km) Open Water National Championship that takes place on September 22nd in Tennessee.